Because integration can be hard sometimes. After tinkering around a bit with the new feature I found some peculiarities which I will share here. I decided to go with a similar setup as in the tutorial described above. 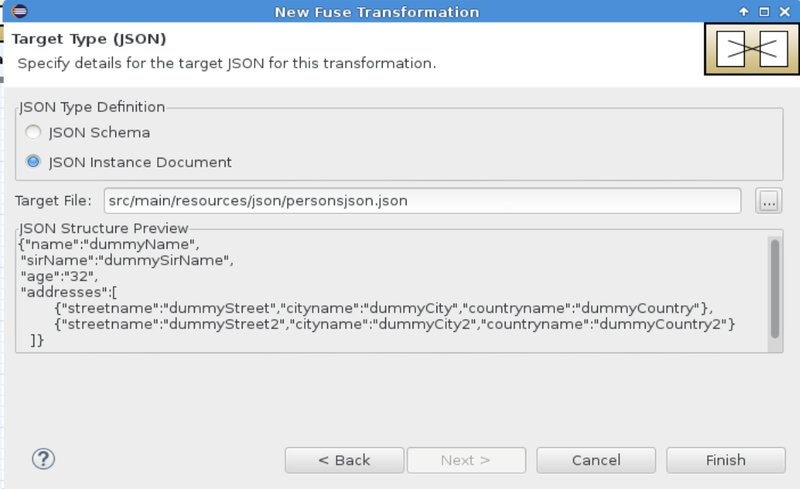 Transforming a xml document into a JSON document. 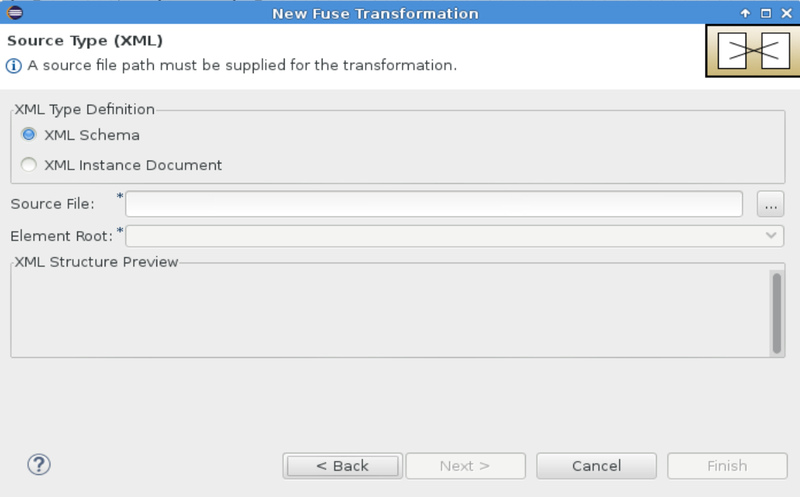 When creating a new data transformation drag and drop the “Data Transformation” component from the palette to the canvas. 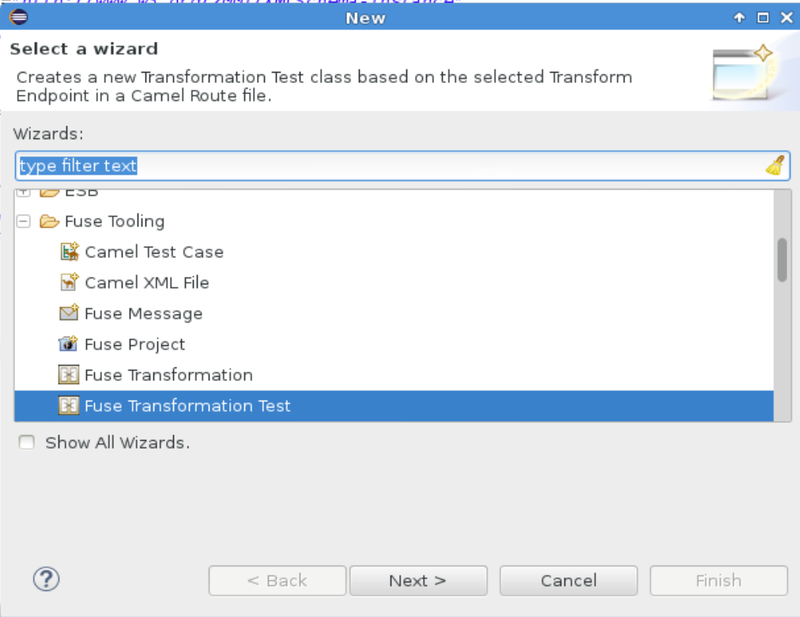 This will bring up the wizard for setting up the data transformation. 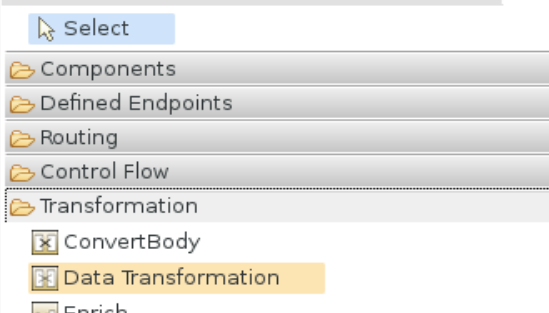 The “Transformation ID” field is a unique identifier for the transformation, similar to the id field in a bean defined in the OSGi Blueprint configuration. The “Source Type” and “Target Type” drop downs allow you to select the source and target specifications. The choices in the drop down are Java, XML, JSON and other. Other basically means you have to generate/create your own java type representation of the message format. For example using Bindy or BeanIO for CSV messages. Using the XML and JSON options will generate the java object for you on the fly, which is very handy. 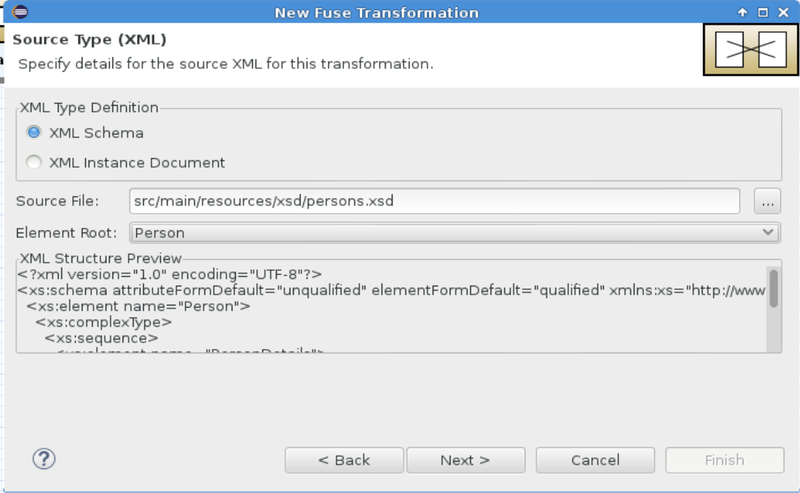 When selecting XML as the source and JSON as the Target type and click next the next screen is the xml type window. Here we can select our XML schema as source file and select Person as root element. A preview is displayed in the “XML Structure Preview” window. Clicking “next” we move on to the JSON type window. 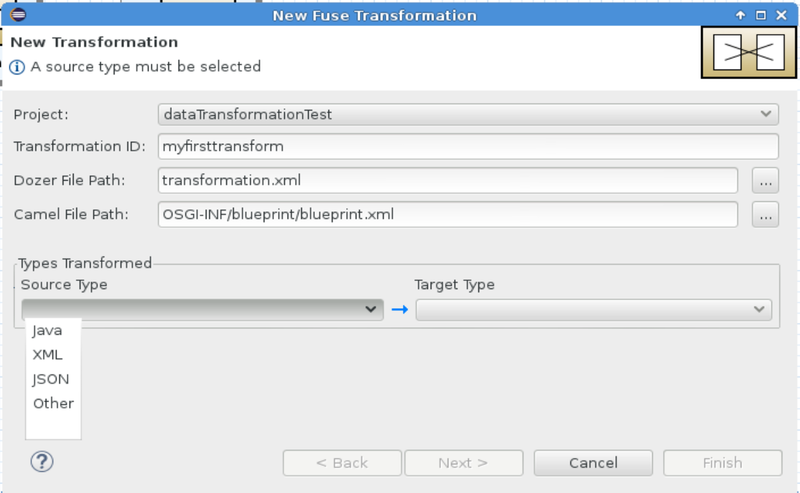 When clicking “Finish” the graphical Data Transformation screen is displayed and we can begin mapping the fields. To map the fields simply drag the source field to the required target field. Now we have to wire the components in the route together to finish things up. As we can see an endpoint has been created and configured with the Dozer component. Also two data formats have been created representing the xml schema and JSON documents respectively. To complete our test just fill in our test method and we’re good to go. For this example we are just going to feed the producertemplate with a sample document and check the log. Normally you would create a more detailed unit test containing assertions and what not. Now run it as a Junit test and inspect the log. Now above we created one of the simplest transformations imaginable. A common use case and still pretty straightforward is performing some filter action inside a loop. In this example we want to filter out some addresses in our transformation. As an example we only want to transform the address with “testcountry2” and ignore all others. A real life scenario would for example filter all billing addresses from postal addresses. The data transformation offers next to the basic field mapping we’ve looked at previously also a couple of other options. 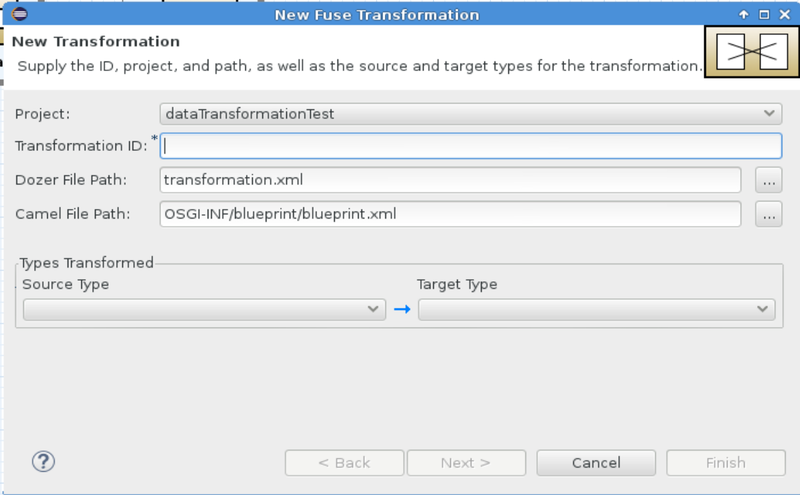 The “Set field” option is just what we already performed to select a target and source field for the transformation. The “Set variable” allows us to use a variable we can define on the variable tab on the source pane. The “Set expression” allows us to leverage on of the Camel supported expression languages to perform some data manipulation. 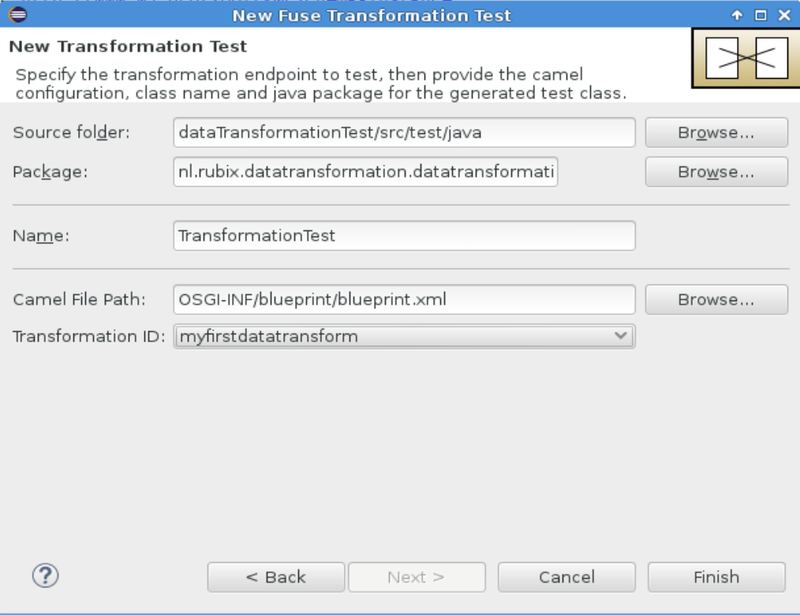 And finally the “Add custom function” allows us to create a Java helper method so some custom transformation logic can be implemented. Since using XML as source for the data transformation, I initially tried to create an xpath expression performing the filtering. After all filtering in xpath is quite easy to do. However here I experienced some behaviour I did not expect. Basically, two things have happened, first the filtering is performed correctly, but the output of the filter is “paste” into the target field. This is also mentioned in the tutorial I linked to above, but this does mean this simple use case is not supported using expressions. This also seems a bit unintuitive. To implement the filter use case I ended up creating a custom function. Click the “C” button to create a new class. 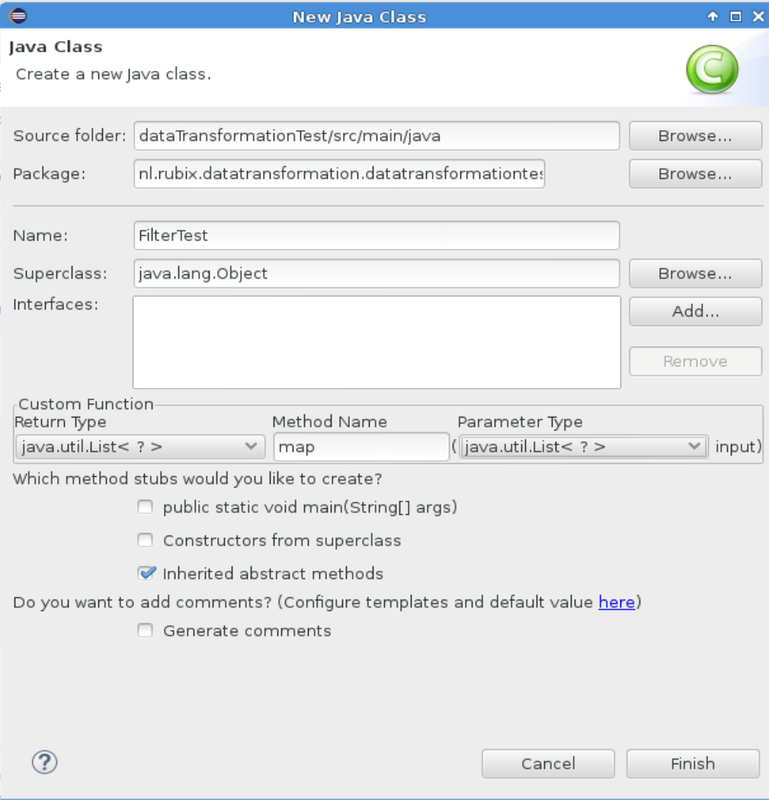 In the screen that follows, select a Java package, enter a Class name and select the Return type and Parameter type. Now when we run the unit test and observe the logging we can see the correctly formatted JSON. 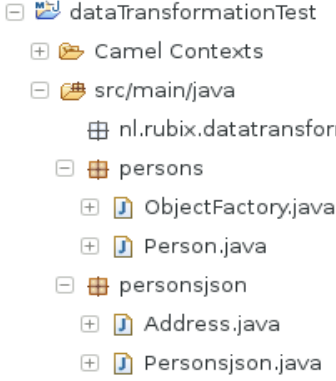 Although the data transformation functionality is very nice, I am a bit disappointed that for such a simple and common use case as filtering a custom Java class has to be created. This will probably mean for most data transformation we still cannot eliminate custom code. Something a graphical data transformation tool should aim at. But in all fairness the data transformation is still in tech-preview phase so who knows how it will look like and perform when it is officially supported.